Nathan Crawford was born September 16, 1909 in Appling Georgia, son of Thomas Remsen Crawford and Winnifred Williams. Nathan started work for the International Nickel Company in 1933. In 1935 he was a skimmer, and boarded at 2 Oliver Street. In 1936 Nathan was a foreman. By 1938 Nathan was living at the Algoma Club at 12 Park Street East. From The Inco Triangle of October 1938, "Nate Crawford's "Gashouse Gang" from Copper Cliff, under the able coaching of "Specs" Telford, won the Royal Trading League softball championship this summer." In 1940 Nathan worked at the Copper Cliff Smelter. He enlisted in 1941 while living at 1 Serpentine Street (the McIntosh Block), apartment 8. His wife Elizabeth 'Eliza' Sutherland Crawford moved from Copper Cliff to Chatham, New Brunswick. Nathan graduated from No. 5 Initial Training School at Belleville as Leading Aircraftman. He was posted to No.6 Air Observer School, Prince Albert, Saskatchewan; to No.5 Bombing and Gunnery School, Dafoe, Saskatchewan, and served there to June 1942. Posted to No.1 Central Navigation School, Rivers, and commissioned July 1942; posted to No.4 Air Observer School, London, Ontario and served there until October 1943. Nathan was promoted Flying Officer, and Flight Lieutenant . He was sent to “Y” Depot, Halifax, and arrived in Britain on 30 October 1943. Posted from No.3 Personnel Reception Centre, Bournemouth to Upwood, January 1944 (Pathfinder Force Night Training Unit). Posted to No.156 Squadron, March 1944. Nathan was promoted Squadron Leader, August 1944 and went to No.405 Squadron, in October of 1944. Nathan was killed in action with No. 405 Squadron on January 2, 1945. On that day Lancaster PB477 took off from Royal Air Force Gransden Lodge at 1558 hours on the afternoon of 2nd January 1945, detailed to attack Nurnberg, Germany. The aircraft was due back at 2200 hours but nothing was heard from the aircraft and it failed to return. A Missing Research and Enquiry team reported : “ Eyewitness at Rohrau reported that about 1900 hours they saw a Lancaster on 2nd January 1945 fly in from the west and crashed and burnt near the village. The aircraft crashed at Rohrau, 16 miles south west of Stuttgart, Germany.” The aircraft was shot down by enemy fire. Five of the crew were killed, and two were taken Prisoners of War. Those killed were buried in the Durnbach War Cemetery, Bayern, Germany. Nathan's Distinguished Flying Cross was presented to his widow on April 1, 1949 "in recognition of gallantry and devotion to duty in the execution of air operations against the enemy." Among the papers of Millicent Sutherland-Leveson-Gower (1867-1955), the fourth Duchess of Sutherland are letters written to her during the Second World War by RCAF Squadron Leader, Nathan Crawford who was killed in action on January 2nd 1945. A leather framed photograph of a man, presumably Nathan Crawford, in an RCAF uniform accompanies these letters. The letters in envelopes addressed to Lady Millicent Sutherland were written from the Officer’s Mess of the Royal Air Force Station, Upwood, Huntingdon. 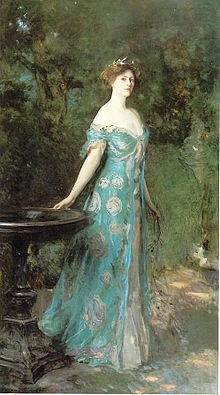 They were written during 1944 and suggest that Crawford was a good friend of the Duchess and her granddaughter. The letters provide poignant and moving insights into the experiences of men serving on the front line. 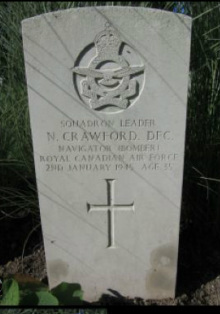 Crawford was a Canadian stationed in Britain. Many letters refer to social occasions, and discuss plays and novels and foreign places visited. Many also describe his thoughts and feelings, and his increasing homesickness for his family.